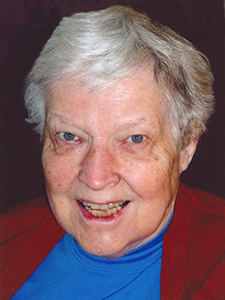 Sister Jean Richter, O.P. (Honoria) was born July 19th, 1927 in Chicago, and died January 30th, 2016 at the Sinsinawa Motherhouse. Due to her father’s job at Montgomery Ward, she attended several schools, beginning in Evanston, Illinois at Oakton Grade School, and finishing up at Holy Angels Academy in Minneapolis, where she graduated in 1945. After one year at Rosary College (now Dominican University) in River Forest, Illinois, she made her first religious profession as Sr. Honoria on August 5th, 1948. Jean got her B.A. in French at Rosary College (1954), her M.A. in History from Fordham University (1960), and her Ph.D. in European History from the University of Wisconsin Madison (1972). The title of her dissertation is Currents of Spirituality in 18th Century France: Nuns, Sisters, and "Philosophes." While studying in Paris at the Institut Catholique de Paris, Jean was present during the “May ’68” events of civil unrest. During her career, she taught at several schools in such cities as Milwaukee, River Forest, Illinois, New York City and Madison, Wisconsin at the Edgewood Campus School, where she later served on the Board of Trustees. At Edgewood College, she taught History, served as the Chair for the History Department, and later was named College Archivist.